The theme of the conference is the culture of earth building and it will explore how people and places reflect the experience of building with clay. EBUK are working with the Tay Landscape Partnership and the local community on a 3-year programme of activities to explore and celebrate local earth heritage. 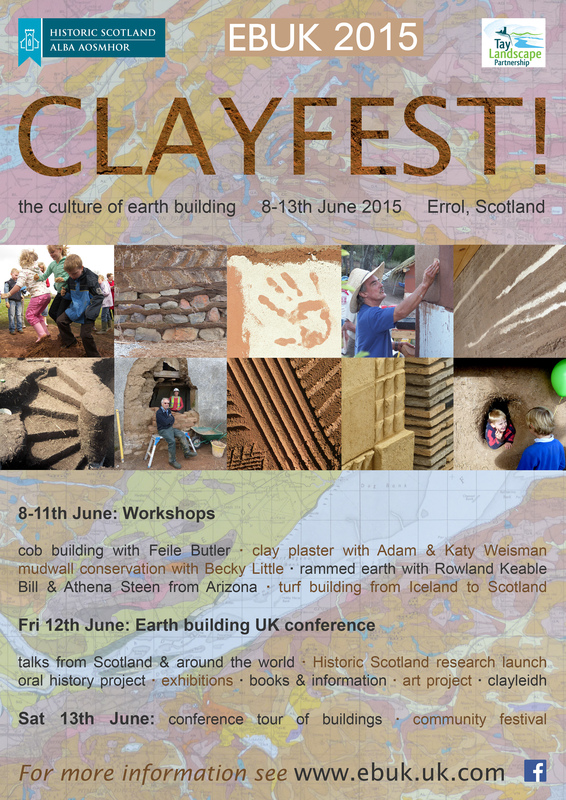 Clayfest 2015 will give people the opportunity to get involved in some of these activities. The week will include four days of hands on workshops covering a range of techniques including rammed earth, cob, mudwall conservation, clay plasters, turf building, and clay/fibres. Following this the annual conference will take place on Friday 12th June which will involve talks from around the world and the chance to talk to some of the experts afterwards. And, of course, the day will culminate in a traditional Scottish clayleidh!